Since arriving in Dublin last June, I’ve often noted to visitors and friends my appreciation of the vibrant culture of lifelong learning not only in the city, but throughout Ireland. The array of courses and other educational activities scheduled throughout the year for adults—most of them free—means there’s something for everyone and for every question or mood. Thanks to being on sabbatical, I have been able to take advantage of quite a few of these opportunities. As my hundreds of pages of notes and thousands of photographs attest, I have spent the year being a learner, and it’s been wonderful. With so many intriguing offerings, choosing what to attend is a problem. The universities, colleges of every size and type, museums, libraries and other institutions, and even magazines and various private societies regularly give one-off or multisession courses for adults on a host of academic and practical subjects. By the end of my sabbatical, I’ll have completed three of these with University College Dublin: a course on the Easter Rising of 1916, another on the War of Independence 1919-22, and a third on James Joyce and the National Library. The quality of the teaching and information is very high–I’m quite picky, being a teacher myself–and all three courses have included the latest scholarship. Every week there are new programs and events advertised at venues around the city: lectures and book launches, exhibitions, concerts, poetry and fiction readings, walking tours and house tours, festivals, special events and tours at museums, film screenings and discussions, hands-on activities like art classes or writing classes, panels and debates, and every other sort of program you could imagine. Two nationally sponsored events, “Heritage Week” in August (see “7 Heritage”) and “Culture Night” in September (see “13 Folding Landscapes”), invite the public behind the scenes of history, scholarship, art, music, writing, and architecture for free tours, lectures, and more. I attended twelve different events during Heritage Week and regretted the things I missed. And what’s even more impressive is that almost all of these events are “absolutely jammers,” and many are booked out far in advance. I’ve learned to arrive early and claim my seat. On Easter Monday, the Irish television station RTÉ took over O’Connell Street, a broad avenue at the center of town, for an all day program called “Road to the Rising.” The idea was to host an array of events—some serious, some just for fun—recreating Dublin in 1915 in the months leading up to the Easter Rising of 1916, the centenary of which will celebrated next year. In addition to street shows and exhibits depicting everyday life in 1915 and lots of people strolling around wearing period costumes, a wide-ranging program of lectures on historical topics was planned for the reception areas and ballrooms of the local hotels and some of the theaters. Though most of these rooms held four to five hundred, the lectures were mobbed, and seats filled an hour before starting time. Apparently over 50,000 people turned out for the event! We arrived early but couldn’t get in to anything—this is the way it often is here. Nothing daunts the avid learners of Dublin. The other day I signed up to go on a walking tour of Georgian and Victorian Dublin led by Frank Cullen, who recently published a book called Dublin 1847 City of the Ordnance Survey, an account of a famous map of the city published that year so detailed it includes plantings in back gardens and the furniture layouts of some buildings. 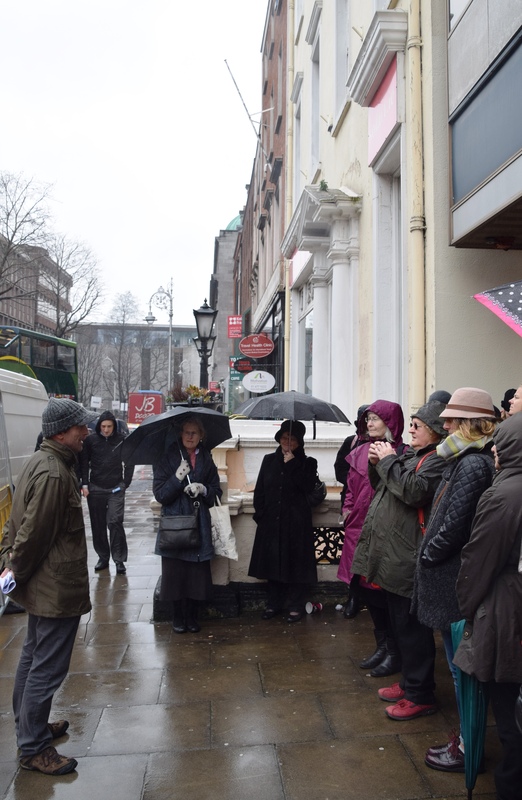 It was cold and pouring rain that day, but twenty-five people showed up and stuck it out for the entire two-hour tour, riveted by Frank’s tales of the goings on at the various buildings and sites he had researched. People will stand in a crowded room to hear an entire lecture or queue outside in bad weather for hours to make sure they get in. My historian and librarian friends at home would be thrilled to see the excitement the release of the Military Service Pensions Collections has spurred here in Dublin this year, with lectures on the contents of these documents from the Easter Rising and the War of Independence filled to capacity. A highly educated population hungry for more—that fact about Ireland provides one explanation for the wealth of offerings and the high attendance. There is a refreshing, prevailing ethos among institutions that educating the public is important to their identity and purpose. 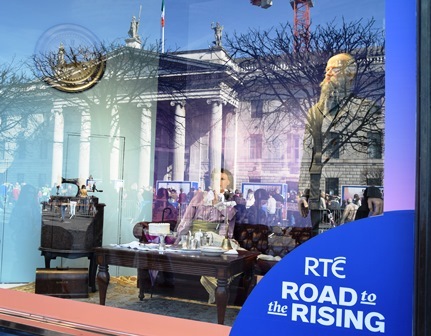 The “Decade of Centenaries” of important events in Irish history, which I’ve mentioned before, has generated many programs, with each institution identifying its particular role in remembering and commemorating the past. The government supports community education and cultural programming to a greater degree than in the US, though people here grumble about cuts and backpedaling on this front. Besides the courses, most of which charge minimal fees, most events are free, so the only obstacle to attendance is getting there in time to get a seat or a slot. As the gray heads in the lecture at the Royal Irish Academy indicate (see photo at top), retirees and people with flexible working hours make up a large part of the audiences, but there are always plenty of young and middle-aged adults as well. The popularity of—indeed, the mania for—lifelong learning has deep historical roots. 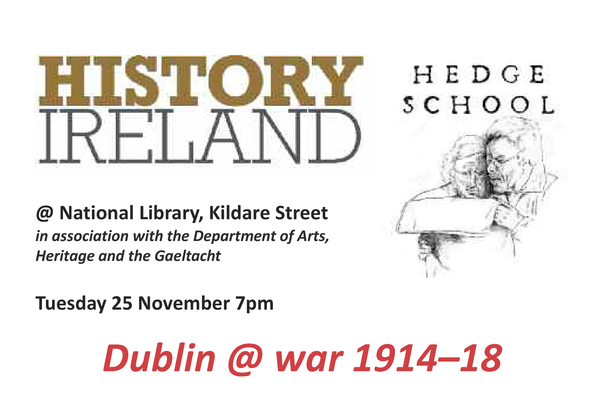 A high proportion of the “learning” events offered by both professionals and amateurs focuses on Irish history with its many invasions, its rise and fall as the leading civilization in Europe, and its long, contentious struggle for independence lasting almost a millennium. Who were the heroes? Who were the villains? Who really owns Irish history? What does it mean to be Irish?—these debates are very much alive today. When three political parties each hold their own exclusive commemoration for key historical events such as the Easter Rising, you know it is a contentious history, one that is still being argued today in pubs, in taxis, on the streets, and at every lecture or panel remotely linked to history—at least those are some of the places I’ve heard it argued. 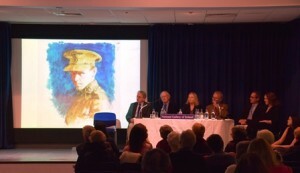 Couple that with widespread criticism of the schools, past and present, for ignoring Irish history or for presenting a one-sided view of it—a party line that was pro English in the past, pro nationalist for a good part of the twentieth century—and you can see why adults at least are eager to learn more and to have their questions. 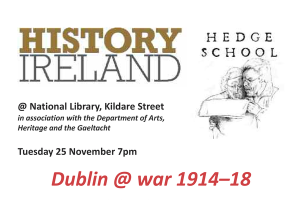 At almost every lecture or book launch I’ve attended, some person in the audience raises this problem—the ignoring or distorting of Irish history in the schools—and many people in the audience murmur their agreement. Going back even further in time, Ireland’s contentious history fostered yet another phenomenon that underlies this countrywide passion for lifelong learning—the hedge school. In order to spread allegiance to the Anglican Protestant church in largely Catholic Ireland, the English rulers of Ireland suppressed Catholicism from Cromwell’s time forward and starting in 1723 imposed a series of Penal Laws that circumscribed Catholic life in intolerable ways. Among these restrictions, Catholics could not own property or businesses, vote or hold office, or receive an education. So a mass underground movement to educate the Catholic population emerged. In the seventeenth and eighteenth centuries and even in the nineteenth century, illegal community-based Gaelic language schools educated children and adults in the fundamentals, including the English language and what we would call home economics, as well as in history, Latin, and Greek in some of the schools. These illegal schools were held where space could be found– in hedgerows, barns, clearings, private homes, and sheds throughout rural Ireland. Qualified hedge school masters were forced to be itinerant, holding school when and where they could to escape the notice of authorities. The schools often dissolved or changed location suddenly so as not to be detected. In 1826 a British government inquiry found that of the 550,000 pupils enrolled in Irish schools, 403,000 attended hedge schools. Even when the Penal Laws were rescinded and Catholic rights restored to some extent, clandestine education in rural areas continued. The Catholic population of the country—parents, priests, and others—obviously supported this mass movement, and it sowed the seeds of defiance that would underlie the periodic rebellions against British rule that finally led to independence. Today, the locations and occasionally the buildings where hedge schools were held are revered sites in Ireland. Brian Friel’s play Transformations takes place at a hedge school in Donegal in 1832 and brilliantly describes the daily routine of lecture, memorization, and recitation, with the pupils coming and going as they attempt to achieve an education while also working on farms. Pupils would sometimes walk miles to a school, only to find it was being held elsewhere that day. The schools—held outside or in crude farm buildings at best—must have been very cold and very damp most of the time, and none could afford books or materials. Yet a hedge school education was greatly prized, no doubt partly because having one indicated stamina, determination, and strength of character. The effort to replace Catholicism with Anglicanism went hand in hand with an effort to replace Gaelic with English, so the Gaelic speaking hedge schools also became centers for the preservation of the language. Once Catholic Emancipation was achieved, English speaking national schools were established throughout Ireland, and Gaelic receded even further, especially during the Great Famine of 1845-52, when renunciation of Gaelic was often the condition starving people had to meet before “taking the soup.” Gaelic language learning and preservation became a matter for self-education, too, at this time, culminating in the formation of the Gaelic League in 1893 with its national program of community education outside the British-run school system. 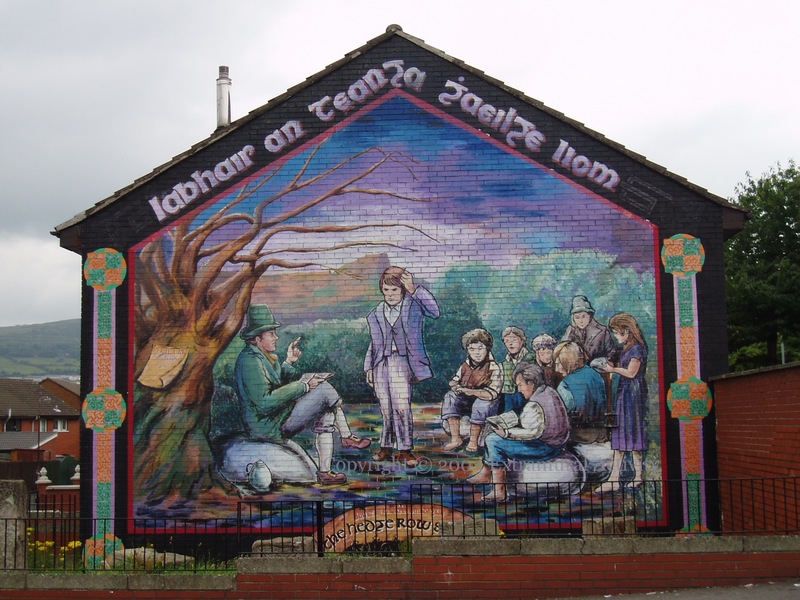 Gaelic language learning also became a hallmark of the revolutionary movement, with the local League chapters essentially educating the future participants in the Easter Rising and the War of Independence. 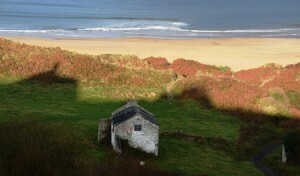 Though today few artifacts or images represent the Hedge School era, and Gaelic is a required subject in the national school system and for most government offices, the spirit of determined self-education lives on, I believe, in the remarkable quality and popularity of lifelong learning in Ireland. I’ve always been drawn to the defiant aspect of education, and in my sabbatical year, I am grateful to have been the beneficiary of this history.